Today, May 1st, we celebrate the 42nd birthday of CHC. You know the story of how a group of Wesleyan University students and Middletown activists formed a free clinic under the banner that“Health Care is a Right and Not a Privilege.” But what’s remarkable about the journey is to see how the spirit, commitment and determination that got the Health Center going has blossomed and grown through the years. This year we played our part in writing history as we focused on enrolling patients in ObamaCare, which will bring health access to tens of millions of our neighbors, friends and family across our great nation. But we also took time from that effort and the daily services that we provide to communities across Connecticut – in over 220 locations caring for 130,000 patients – to “Lean in and Listen” to our fellow colleagues. Staff members gathered in small groups that brought people from different parts of the organization together, and we shared a “six-word story” about what motivates us to do this work. These stories were powerful, compassionate, personal, and heartfelt. They underline the bond that binds us together from one generation of Health Center staff to the next – it shapes our work but more importantly reminds us of the higher cause that attracts bright and talented people to do this work. It is abundantly clear that the same vision for health care justice not only animated activists when we were first getting started, but moves all of us today. 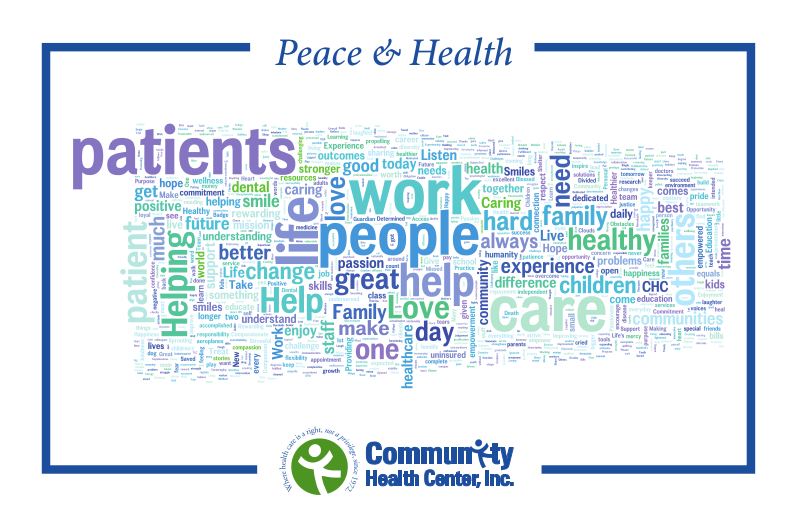 Making time to hear these stories – understanding how these live in each of us – makes CHC a better organization. Below is a word cloud, taken from the words that appeared most frequently in your stories. It reveals the heart of CHC – the compassion and vision of its people. Thank you for all that you do to help make CHC such a great place.